December 26, 2011 / May K.
Insulin is a famous hormone involved in the regulation of our metabolism. In its active form, as a monomer, it can reduce the level of glucose in blood by transporting the sugar into the cell. While inactive insulin is stored as a hexamer complexed with a zinc ion. 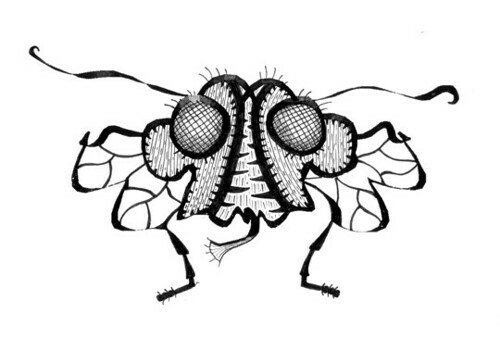 The drawing of the fly is produced from an insulin dimer. hah! cool concept and subsequent blog. so awesome in a deliciously nerdy way! Can your machine support a rendering of a specific dsDNA sequence bound to helicase, clamped, and also bound to a topoisomerase? The protein-viewer I use can open every protein whose 3D structure is known and available in the pdb format (they are stored in the pdb data base: http://www.rcsb.org. I know that such 3D representations are available for all three proteins you listed. I can try to produce a drawing of one of them or maybe of a domain/subunit (as these proteins are rather big). However, there is a difficulty in this story: the type of representation I use in the protein-viewer traces the secondary structure of proteins, it can also represent DNA, but you won’t see any difference between different DNA-sequences (so the DNA will always look the same). But I will definitely try it, thank you for the ideas! Such a unique, captivating concept for a blog and for art! Being a former art student, it’s so amazing to see some of my favorite subjects, seemingly unrelated, combined together to make a beautiful outcome. You’ve a new follower. I look forward to your future posts! How did this all begin? Thank you, it’s so great to hear compliments from a real artist! Actually my hobby started after I had to congratulate my former professor on his anniversary. 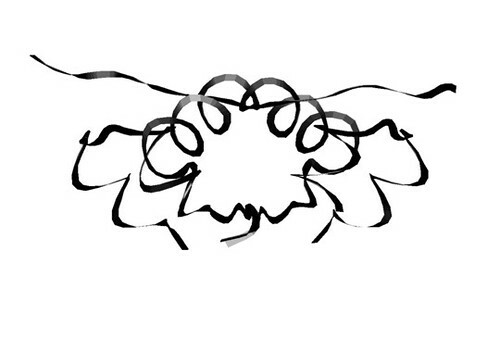 I didn’t know what to do and desperately tried to find inspiration from his papers. 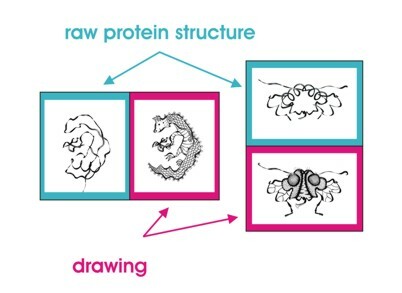 Than I realized that the protein structures he was working on looked like funny creatures. That was when I produced my first drawings. Later my grand aunt showed me her drawings based on mathematical functions and I saw that combination of art and science can lead to beautiful results. That was why I decided to keep on working on the idea of producing art out of proteins.